One of the first things people notice about a person (in addition to your 'do) are your eyes -- that's why you have to shape and groom your brows to achieve the perfect frame. If you've over-plucked in the past or just aren't sure where to start to arch your eyebrow or how to shape it, these tips can help. You look at your face every day, but you probably don't pay all that much attention to your brows. The key to correctly shaping your brows is to embrace your brow shape, not fight against it. 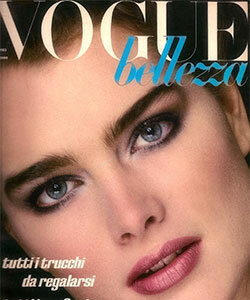 If you have thicker, Brooke Shields-esque brows, you shouldn't pluck them into oblivion. Beauty experts have different opinions and they use different starting point on how to achieve the best possible shape for any given face. 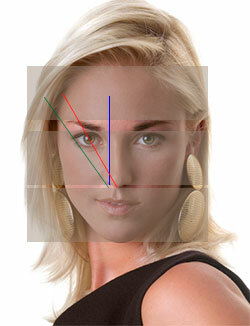 For example, eyebrow expert Anastasia Soare utilizes the concept of golden ratio to determine the best possible shape. Although this concept is mathematical in nature and might sound like sending a rocket to the moon but many have found it useful and they put it into good use. Blue line shows where the eyebrow should or could start. Red line starting at the tip of the nose, go through pupil, and it represent where the arch should start (highest point of your eyebrow). And green line starting at the outer corner of the nose and go through corner of eye, shows where the eyebrow should end. Your face should divide equally into hairline to eyebrows, eyebrows to the bottom of your nose and the bottom of your nose to your chin (second image above). In combination with placed lines, this will give you the area in which you can play with eyebrow and regulate hight and thickness. The above method is useful for plucking, threading and grooming and provide a guideline on how to arch your eyebrow; Where to start, where to make the arch and where to end, but it won't tell you how to define the best possible thickness or the precise shape of the eyebrow. The first is taking an eyebrow pencil purchased in most drugstores and draw on different eyebrow shapes. Think of it like the research you did in determining if short hair would be right for you. Another option is to purchase a brow stencil kit that serves as a guide for eyebrow shaping. An example is brow stylist-to-the-stars Anastasia “Classic Stencils” kits that allows you to place petite, slim high, medium, high and full arch eyebrow stencils for you to practice shaping. In combination to all above, you can also add the guide for facial features into the mix in order to choose what works best for your face. For example, if you have delicate facial features, larger brows could overpower you. The reverse is true for a larger face and thin eyebrows. If you have oval face, you have several options. You can also try to shape your eyebrows in a way that they slant slightly upwards without looking like Mrs. Spock! 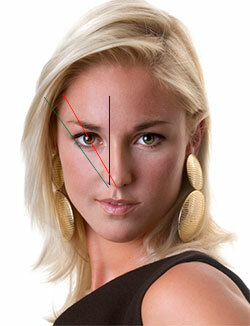 If your face is more angular or square in shape then a gentle arch above the center of eyes could soften your look. 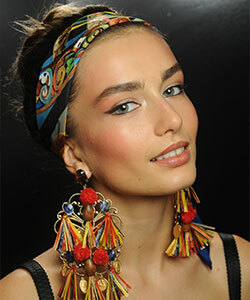 If you have strong chin, you can experiment by extending the outer ends of your eyebrow to add width. For round face you can use a very soft arch. And for long face, try a straight brow or very low arch. Brow pencils, powders, brow gel, tweezers, stencils, scissors and brushes -- there are many tools available to tame your brows. If you take a back-to-basics approach, the chief tools you'll need are a pair of tweezers and an eyebrow pencil. Slanted tweezers grasp smaller or ingrown hairs while a wider slant grabs longer hairs. The best pair for you depends upon your skills and eyebrow hair type. Tweezerman is a tweezing specialty company that makes high-quality tweezers without being too high-priced (it doesn't hurt and they often come in colorful options too). The next step is an eyebrow pencil, which can be tough to select the right shade. You want to match it to your hair color or just a slight shade darker to prevent your eyebrows from disappearing. A favorite is Estee Lauder's “Automatic Brow Pencil Duo,” which is double-sided with an automatically sharpening pencil on one end and an eyebrow brush on the other. The pencil also comes with a refill, so you'll have a backup too. Pencils can be easy for brow-shaping beginners to use because you're familiar with using a pencil for writing or possibly for eyeliner. Your pencil should have a soft finish and not appear too heavy or wax-like when you apply short, small strokes to your brows. If you find an eyebrow pencil appears too heavy-handed, however, you can try an eyebrow gel or powder, which takes slightly more technique but appears more natural. Unlike eyeliner that tends to be applied in a straight line, eyebrow pencil use requires short, light strokes that make you feel like an artiste. 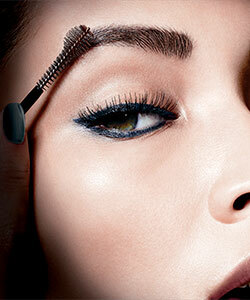 Brush your eyebrow hairs up with your finger or an eyebrow brush and use the pencil to first fill in any sparse areas. Follow your natural eyebrow shape, using small, light strokes. Smooth your eyebrow hairs back into place and examine your handiwork. If you have unruly brows, a small amount of brow gel can tame them. Gently brush brow gel on, much like you would apply mascara. If you don't have brow gel handy, you can use an old toothbrush and a small amount of Vaseline to add shine and definition to your brows. You have a thick eyebrow? - As first attempt, don't pluck them into oblivion, instead try to work around the natural curve. You may not even have to tweeze your brows at all! - Use Eye Studio Brow Drama from Maybelline to shape and even color your brow to create dramatically bold and sculpted statement.